• under deformation-controlled conditions, concrete members fail in flexure when their 5A.3.I.2(5), ultimate deformation capacity is reached, regardless of their force capacity, 5.5.3.1.3(5), an underreinforced beam may fail abruptly in flexure in a force-controlled manner, if its cracking moment exceeds its yield moment. 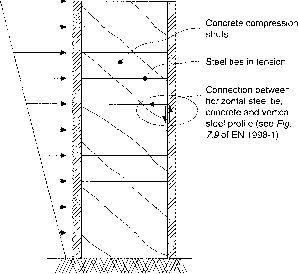 The reason is the inherently brittle nature of concrete cracking and the large deformation energy released when this happens, especially if the beam cross-sectional area is large and that of the longitudinal reinforcement is small. So, enough longitudinal reinforcement should be provided to ensure that the yield moment of the beam exceeds its cracking moment. Because the seismic bending moments in the beam are very uncertain, this requirement is imposed on all sections of a beam and for both signs of bending, irrespective of the moment from the analysis for the seismic design situation. bd bdfyi /yk where the mean value,/ctm, is used for the tensile strength of concrete, and the characteristic or nominal value,/yk, for the yield stress of the longitudinal reinforcement. It is noted that the real danger for the section is fracture of the minimum reinforcement and that the margin between its tensile strength,/t, and/yk, which is of the order of 25%, provides some safety against overstrength of the concrete in tension (the 95% fractile of fct exceeds/ctm by 30%).